Why is Node.js logging challenging? Many organizations today have multiple systems and applications producing tens to hundreds of gigabytes of log data on a daily basis. It is not easy to centrally manage all logs in a secure, scalable, and efficient manner. Today, development teams are also tasked with code maintenance and runtime operations. They often lack tools that simplify node.js logging over a common platform for the system as well as application-level logs. Text logs offer little help when it comes to detecting patterns over a period of time. Teams need advanced data visualization for generating useful reports and extracting actionable insights from the data. 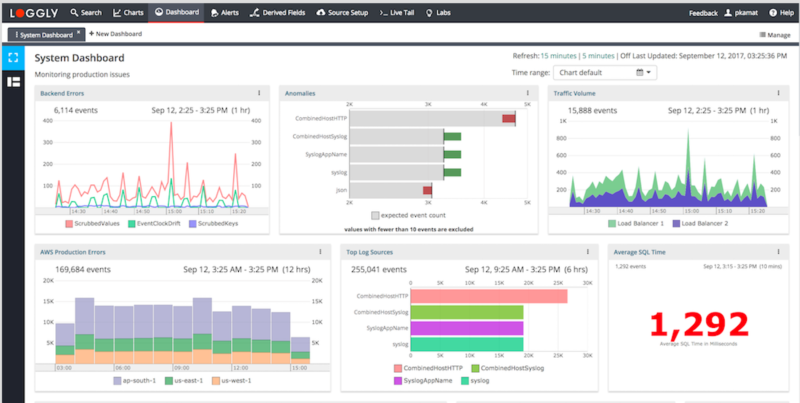 SolarWinds® Loggly® is a cloud-based log aggregation tool that provides a simple approach to collect and manage all your logs in a quick and efficient manner, without any need to set up a node.js logging server. You can easily send logs from node.js applications to Loggly using our winston-loggly-bulk package. Alternatively, you can also use Node-Loggly, Bunyan, and Morgan logging libraries for sending logs to Loggly. A quick and simple setup is designed to ensure that you don’t have to spend endless hours just to get things started. With all your logs in one place, you can make better decisions related to security, privacy, and performance in node.js logging. Furthermore, Loggly gives you the option to archive your logs in Amazon S3 buckets, once they are past their log retention period. Loggly is built for interactivity and speed, which means you can extract more out of your logs quickly, without any prior knowledge of proprietary query languages. Whether it’s an event that took place today or a week ago, Loggly’s powerful search is built to give you near-instant results. Moreover, with a single click, you can view all events surrounding a critical event to resolve issues in a seamless manner. You can trace all your logs across your distributed stack in real-time with the Live Tail feature. With filtering and color coding, you can prioritize your log data for easy understanding and faster analysis. Loggly offers advanced data visualization and interactive dashboards that help in a faster analysis of node.js logging data. You can create sharable charts and sync them to a particular time frame with a single click. This visualization is designed to help you pinpoint issues and trends, track SLA compliance, and create easily sharable reports. Loggly’s Dynamic Field Viewer takes log analysis experience to a new level by automatically producing a real-time summary of all logs in a highly structured manner. It is unlike any other search bar or console where you have to know what you are looking for in advance. The feature allows you to find anomalies or browse through logs within a few clicks.